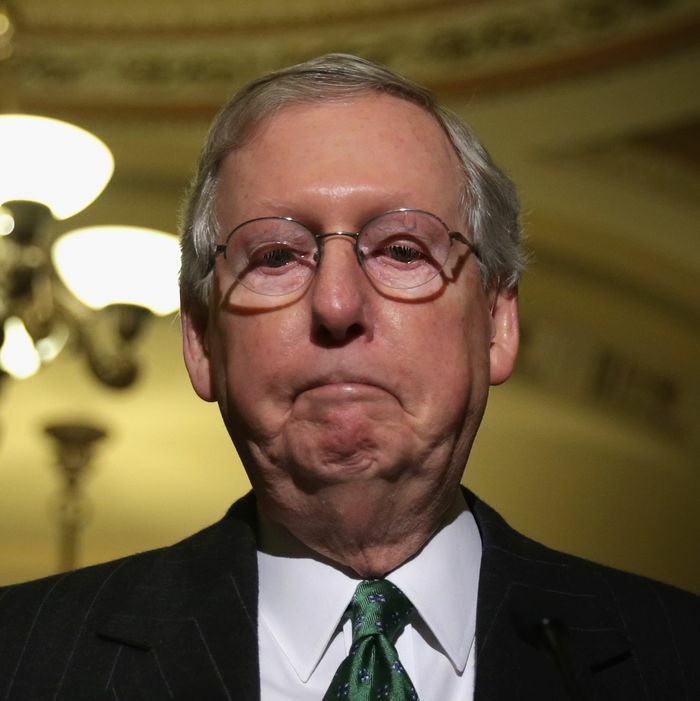 Hours after senators Mike Lee and Jerry Moran announced their opposition to the Republican health-care bill, leaving Senate Majority Leader Mitch McConnell two votes short of the number needed to begin debate on the Better Care Reconciliation Act, McConnell finally admitted defeat. “Regretfully, it is now apparent that the effort to repeal and immediately replace the failure of Obamacare will not be successful,” he said in a statement issued late on Monday night. McConnell isn’t just dropping the Republicans’ seven-year battle against the Affordable Care Act. He’s going to give the GOP’s original “repeal and delay” tactic one more try by holding a vote in the coming days on a straight repeal of Obamacare, with a two-year delay in implementation. The measure guts the law by repealing authority for the federal government to run healthcare exchanges, and scrapping subsidies to help people afford plans bought through those exchanges. It zeros out the penalties on individuals who do not buy insurance and employers who do not offer health insurance. The idea is that once Republicans start the clock on turning Obamacare into an actual “failure” (which, conveniently, will take place after the midterms), they can force a few Democrats to go along with the amazing GOP replacement plan (which they haven’t come up with yet). As McConnell notes, Republicans already used this process to pass an Obamacare repeal bill, and only two GOP senators — Susan Collins and Mark Kirk — were opposed. However, that was back in 2015, when Republicans knew Obama would just use his veto to save his signature health law. Now that the GOP is using real bullets the calculus is very, very different. “Repeal and delay” was all the rage among Republicans in November and December, when they were still giddy about Trump’s win. But that approach collapsed in January when President Trump and Senator Rand Paul agreed that Obamacare should be repealed and replaced simultaneously. Weirdly, at the end of June, Trump and Paul started promoting “repeal and delay” as a novel strategy to solve the GOP health-care push. But in the past six months, at least nine senators have promised not to repeal Obamacare without a replacement plan. There is almost no chance that the repeal-only measure will pass, especially because it already has a Congressional Budget Office score, and it’s even more horrific than the estimates for various versions of the failed GOP replacement plan. Obamacare’s insurance markets depend on the voluntary participation of private insurance companies, and most of them see those markets as difficult long-term investments. Many of them might choose to retreat to safer lines of business in the uncertain “zombie” period between the passage of such a repeal bill and its ultimate enactment. The result might be chaos for consumers unable to find affordable plans — or even any plans, in some parts of the country. Lawmakers may not be able to control the timing of Obamacare’s demise with such a strategy. March 23: Trump gets in a truck, House GOP pulls healthcare bill. July 17: Trump gets in a truck, Senate GOP healthcare bill stalls. Trump had no idea defections were coming tonight, according to another White House official with knowledge of the meeting. “Why would we have a dinner like that if we knew people were going to drop out?” the official said. Democrats were celebrating a hard-fought victory on Monday night, but activists warned that the fight isn’t over, and Indivisible said it would move forward with plans for a day of health-care action on Tuesday. As Politico reported, Trump may not be engaged in the Obamcare repeal process, but he does care about winning — which means the danger still hasn’t passed. To Trump, the Obamacare fight has always been about scoring a win. He doesn’t care nearly as much about the specifics, people close to him say, and hasn’t understood why legislators just won’t make deals and bring something, anything to his desk. … Along the way, Trump has weighed various options, from not paying cost-sharing subsidies and letting the law implode to repealing it without a replacement – which he veered back to on Twitter Monday night. “He told us months ago, we could just let it blow up and blame the Democrats,” said one activist who met with Trump at the White House.